The GRC is excited to announce that representations for the p-arms of the human acrocentric chromosomes can now be found in the GRCh38.p13 patch update of the reference genome, thanks to work done in Brian McStay's lab. These sequences are included on the following scaffolds: ML143366.1, ML143367.1, ML143372.1, ML143377.1, and ML143380.1. The p-arms of the human acrocentric chromosomes HSA13-15, 21 and 22 each bear ribosomal gene arrays (Figure 1) termed nucleolar organiser regions (NORs). These are the most transcriptionally active regions of the genome and direct formation of nucleoli, the largest structures in the nuclei of all human cells. Research on these critical genomic regions is hampered by the fact that acrocentric p-arms are not included in human genome drafts. They are both internally highly repetitive and share a strikingly similar sequence content, making them recalcitrant to standard sequencing approaches. Despite these issues, Brian McStay's lab previously described a collection of sequenced cosmid and BAC clones that allowed them build a reasonable consensus for sequences both immediately proximal and distal to NORs (Floutsakou et al. 2013. Genome Res 23:2003-12). Proximal sequences are almost entirely segmentally duplicated, similar to regions bordering centromeres. In contrast, the distal sequence is predominantly unique to the acrocentric p-arms. Their interphase localisation, open chromatin structure and transcriptionally active state, point to a role in nucleolar biology and prioritise their inclusion in a future genome draft (for discussion see McStay. 2016 Genes Dev. 30:1598-610). 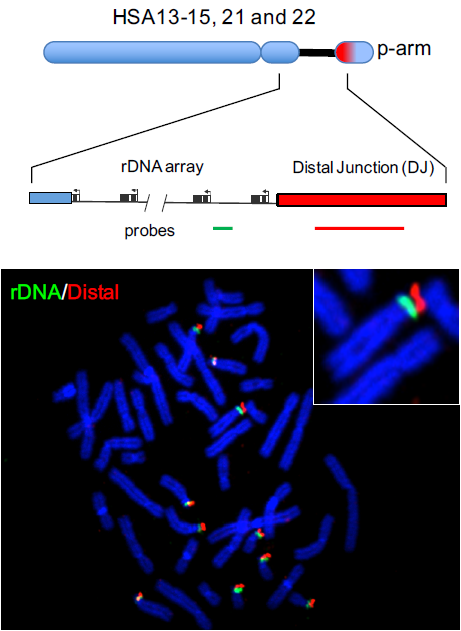 The McStay lab subsequently developed a workflow that has enabled them to determine the NOR distal sequence, the Distal Junction (DJ) from all five acrocentric chromosomes and from an additional two versions of HSA21, ~3 Mb in all. A panel of mono-chromosomal somatic cell hybrids, mouse A9 cells containing individual human chromosomes, allowed them to sequence one chromosome at a time. Sequencing was performed by combining sequence capture with PacBio SMRT sequencing. Pre-capture libraries (typically in the range of 4-6 kb) were prepared from each hybrid line. Capture was performed using oligonucleotide libraries designed using their original consensus. Circular consensus sequencing (CCS) of post-capture libraries generated so called reads of insert (ROIs) each with high sequence accuracy. This allowed the McStay group to assemble sequence contigs from the NOR distal region of each chromosome, regardless of the presence of repetitive sequences such as satellite DNA. Their analysis of these sequences confirms sequence and presumably functional conservation between the acrocentrics. It also provides evidence for non-homologous exchanges between them. It's anticipated that extension of sequence contigs towards the telomeres will uncover increased structural variation between the acrocentric chromosomes. Figure 1. FISH experiment showing the relative locations of the rDNA array and distal junctions on the p-arms of the human acrocentric chromosomes. The GRC is pleased to announce that GRCh38.p13 is now available! This release adds 45 new scaffolds: 43 FIX patches and 2 NOVEL patches. The FIX patch scaffolds provide assembly corrections while the NOVEL patch scaffolds deliver new alternate sequence representations. A valuable contribution to this patch release comes in the addition of the Nucleolus Organiser Region (NOR) sequences for the short arms of the acrocentric chromosomes (13, 14, 15, 21, and 22) as provided by Brian McStay's group (PMID: 23990606). The NOR additions will be discussed in detail in a separate blog. With access to an ever-increasing pool of high quality, long-read human assembly data, the GRC has been able to utilise this in GRCh38.p13 to address genome issues that have until now persisted due either to lack of data, or complexity. Much of the data added in this patch is derived from the CHM1 human haploid hydatidiform mole assembly (GCA_001297185.2). Originally produced as part of an assembly comparison analysis (see PMID: 28396521), the assembly was recently Pilon corrected and re-submitted to GenBank by the McDonnell Genome Institute at the Washington University, a GRC center, with the specific aim of improving the base pair accuracy for use of its sequences in improving the Human Genome Reference. In GRCh38.p13, a total of 28 assembly gaps have been closed. These updates, together with sequences added to correct 5 clone errors, add more than 0.5 Mb of unique data to the assembly. The majority of unique sequences added in this release come from contigs that are components of WGS assemblies derived from PacBio sequence reads, such as the CHM1 assembly mentioned above. However, genomic clone libraries still play an important role in assembly curation. In this release BAC clones from human cell line (CHM1htert) have provided complete, single haplotype representations of clinically important regions such as Prader-Willi on chromosome 15, and CT47 on chromosome X. The CT47 cancer/testis antigen located on human Xq24 is organized as an array of 4.8 kb tandemly repeated units. Due to the repetitive nature of the sequence involved, coupled with the limitations of the technologies available at the time, the representation of the CT47 gene cluster in GRCh37 and GRCh38 was problematic. The region is gapped, and the flanking clones are from different haplotypes. As a consequence, the representation of the cluster in these assemblies was incomplete and biologically unsound, representing an indeterminate number of gene copies (Figure 1, top). Studies have indicated that this polymorphic array is highly variable between haplotypes and ranges from 4 to 17 copies in length. Long-read sequencing of genomic clones has now captured the complete CT47 cluster as a single haplotype. The fix patch (ML143381.1) included in the GRCh38.p13 release now provides a contiguous and validated representation of the CT47 genomic region. This patch closes the assembly gap with sequences from BAC clone AC275592.1 (CH17-182I12) which contains a complete, 7 copy representation of the CT47 array (Figure 1, bottom). Note that this update reduces the number of CT47 genes represented as compared to GRCh37 and GRCh38. Figure 1 Top: CT47 region in GRCh38. Incomplete representation of CT47 gene cluster in GRCh38 due to an assembly gap. Bottom: CT47 fix patch in GRCh38.p13. The gap is closed and a complete representation of CT47 cluster is provided. Optical mapping technology has been used to confirm the copy number for the CT47 array is accurate for the haploid CHM1tert sample (Figure 2), from which the clone library was derived. Figure 2: AC275592.1 alignment to CHM1 Bionano optical map. As more data becomes available using the latest technologies the GRC is able to utilise this in order to continually to update and improve the reference genome. If you have questions about this process, let us know. You can download the GRCh38.p13 assembly, including the alignments of the patches to GRCh38, from the GenBank FTP. 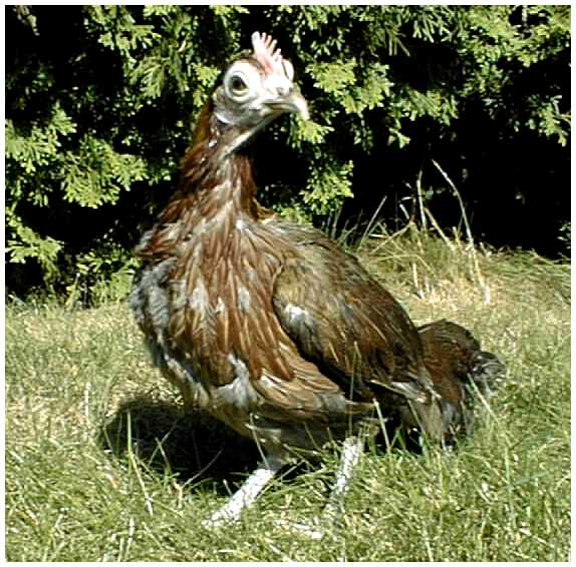 The GRC announces the release of the latest chicken reference genome assembly, GRCg6. The chicken reference assembly defines a standard upon which other avian whole genome studies are based. Providing the best representation of the chicken genome is essential for facilitating continued progress in understanding and improving human health as this species serves as a model organism similar to mouse, zebrafish and other vertebrates. The chicken reference genome project began as an international research collaboration coordinated by the McDonnell Genome Institute with past funding from the National Institutes of Health (NIH) and U.S. Department of Agriculture whose shared goals were to determine the sequence of the chicken chromosomes and annotate all possible chicken genes. The initial genome reference was completed and published in Nature in 2004 and has since evolved in quality. The reference experienced a major upgrade in 2016, termed Gallus_gallus-5.0 (GCA_000002315.3), as a result of long read sequencing technology and added transcriptome data. In 2017, responsibility for the management of chicken genome assembly updates transferred to the Genome Reference Consortium (GRC). The generation of additional sequence coverage comprised of long read data, in particular average read lengths of 12kb, as well as improvements to de novo assembly algorithms has resulted in another upgrade, GRCg6, that has now been released for immediate community use. Manual annotation of de novo assembled contigs that have been integrated with finished BAC clones have produced an assembly with superior metrics of quality, such as N50 contig size of 18Mb and much lower gap counts. Visit the chicken homepage at the GRC website for assembly notifications, report assembly issues or contact us with questions. The GRCg6 assembly will be available in all major genome browsers, and will be annotated by both the NCBI eukaryotic genome annotation pipeline and Ensembl. Ongoing efforts to close gaps and to correct clone problems remaining in the GRCm38 mouse reference assembly have proved difficult. The available clone library resources have been exhausted, and the remaining gaps are recalcitrant to cloning, with either no clones available or gap-spanning clones deleted for the expected genomic sequence. The GRC has previously used contigs from publicly available whole genome shotgun assemblies to provide sequence at some of these gaps, and in some cases have been able to close gaps entirely with this approach. Nonetheless, several hundred sequence gaps, many of which are known to contain genes, remain. With the release of 17 strain-specific genome assemblies from the Mouse Genomes Project, the GRC evaluated alignments between C57BL/6NJ, the most closely related strain, and the GRCm38 reference (C57BL/6J). This evaluation found genes missing from the reference assembly to be present in the new strain assembly. Utilising the C57BL/6J read set (PRJNA51977) deposited in GenBank by the Broad Institute, and used in the production of the C57BL/6J ALLPATHS WGS assembly GCA_000185105.2, the Genome Reference Consortium’s sought to generate local assemblies from these reads that could be used for curation of the GRCm38 reference. The read set was initially aligned to the C57BL/6NJ assembly using bwa-mem. Once completed, reads aligning to the C57BL/6NJ assembly corresponding to GRCh38 gaps and the location of clone-assembly problems in the GRCm38 reference were identified and subsequently assembled using the Geneious software platform (version 10.1.3). The resulting assembly BAMs were then loaded into GAP5 for manual curation. The assembled WGS contigs were then submitted to GenBank. The patch release GRCm38.p6 addresses 20 regions with these newly created and submitted sequences. These contigs fix and improve representation for several genes, examples of which are shown in Table 1 and Figure 1. Table 1: Examples of issues fixed in GRCm38.p6 using assembled Illumina reads. Figure 1 Top: Incomplete representation of Anxa13 gene in GRCm38 due to a deletion in reference component AC152395.9. Middle: clone error corrected in GRCm38.p6. Fix patch uses MF597750.1 and MF597749.1 to add deleted sequence to AC152395.9. It also provided a complete representation of Anxa13. Bottom: Representation of Anxa13 by reference chr. 15 and fix patch highlighting complete representation of Anxa13 (NM_027211.2).